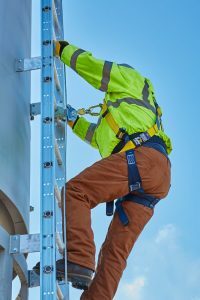 New OSHA Fall Protection System for Ladders - Imperial Industries Inc. Being ahead of the game is on top of the agenda for our Imperial Engineering Team. Knowing that in November of 2018 OSHA was mandating a fall protection system on all silo ladders, we went to work. What was the outcome? When you buy Imperial, you buy quality. 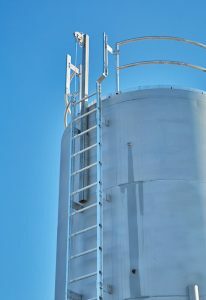 A Silo that will be equipped with a proprietary tested ladder for all load ratings required by OSHA. Trust our team go to work for you! Featured: Stainless-steel tank blasted w/glass beads.